Still sick and knitting on my socks. I made the heel flap too long, or well live and learn. I went to take a photo of the socks but none turned out worth posting. 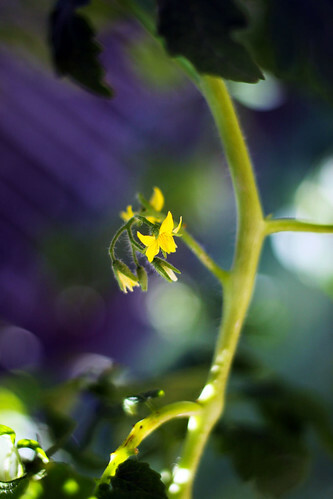 I walked around and saw the first blossoms on the hanging tomatoes. So I snapped a photo. The fence posts blurred into streaks and turned purple. I think the photo is kinda cool in it’s own way. I am already getting lots of basil. It will still be awhile before we have tomatoes to go with it. This entry was posted on Friday, May 22nd, 2009 at 3:00 am and is filed under Garden. Tagged: Garden. You can feed this entry. You can leave a response, or trackback from your own site. That is *absolutely* a gorgeous photo. Waiting is the hardest part, isn’t it! That one little yellow blossom kind of looks like a yellow butterfly! Gorgeous! I love the effect the fence makes!